In light of the violence across America where a criminal uses a weapon to commit a crime, it is of interest to take note of the blatant hypocrisy of those who are to serve the people. This happens when they attempt to try and do a disservice by asking those they serve to do the opposite of what it is that they do (Matthew 23:3). What am I talking about? Recently, the "people's pope" was in America attempting to perpetuate a global anti-gun propaganda. What does the pope have to do with guns you might ask? Well, that's exactly my point. Nothing! Aside of the obvious, Pope Francis is the one who said people who manufacture weapons or invest in weapons industries are hypocrites if they call themselves Christian. Yet, I noticed that he had 18 armed, gun-toting secret service members protecting him from the people that he is to serve, along with bulletproof glass on his car. Funny, I never read where Jesus did that when serving the people. What of the current President, Barack Hussein Obama, aka Barry Soetoro? Barry cries out the plea for necessity whenever a criminal pulls the trigger. He says that he wants to keep America safe. Therefore, he wants to get rid of the guns! How does he want to do that? He wants to disarm you. This is also the same man who voted 242 times to make sure babies are murdered in the womb. He does this while he has 25 armed, gun-toting secret service in view when he goes out in public to protect himself from the people that he is to serve. Since when is it government's business to attempt to strip the rights of the American people away from them? It is not. Neither do they have the constitutional authority to do so. Apparently, these Washington anti-American, anti-gunner politicians have not read the Bill of Rights. If these politicians cannot get you off the Bill of Rights, then what they attempt to do is to get you asking the wrong questions to create an unlawful debate. This debate is designed to gut the pith and marrow out of your God-given right. Let's set that record straight. The United Nations would have you believe that they exist to keep the peace. However, if you take the time to pull the cover off of them (Luke 12:2), you will see the peace they mean to keep is through bearing arms to control the people. 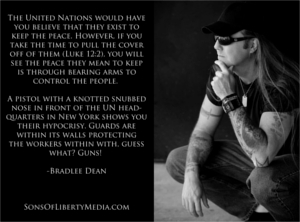 A pistol with a knotted snubbed nose in front of the UN headquarters in New York shows you their hypocrisy. Guards are within its walls protecting the workers within with, guess what? Guns! There is only one reason that they want to disarm America! So, let me ask you, who knows better what the Second Amendment means than the Founding Fathers?